OK, so this is going to be a quick review, as there is not a lot to tell. The before picture is pretty self explanatory. When I removed the 70’s faux wood paneling, it revealed the first of many layers of old wallpaper. One little tug at this first layer, and the horsehair/mud/noxious microbe “plaster” disintegrated and crumbled to the floor. I was left with no other option than to pull it all down and re-face with new drywall. Somewhere in my possession is a picture of my friend Jennifer and me dressed in hazmat suits, cheerfully cleaning up dust and debris. What the picture does not show is that our skin itched clear down through our epidermis, and our faces glowed a disturbing yet intriguing shade of magenta. I have had a few friends help in various renovation projects. They never volunteer a second time. Again, this was a straight forward project. Old mud down, new drywall up. 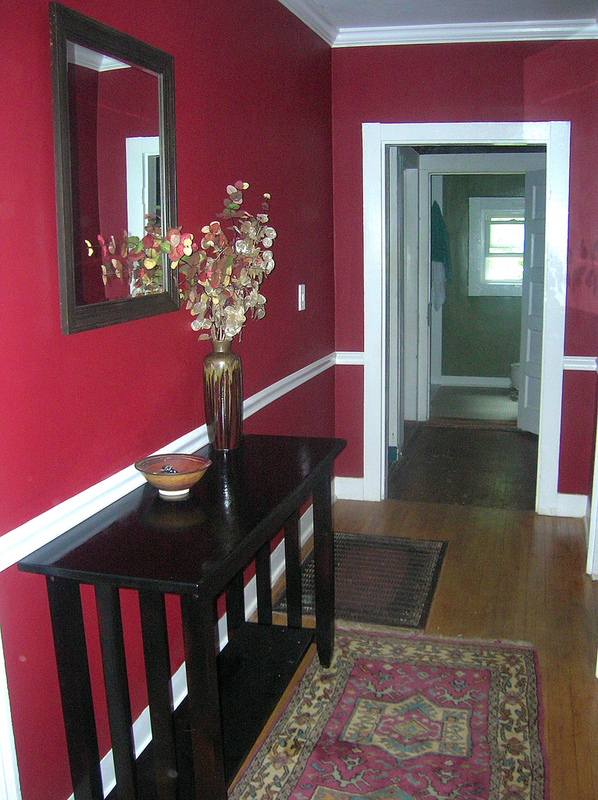 A little trim, a lot of paint, and I had a brand new hallway! Previous Post As I was saying…. Next Post If a tree lies in a yard but made no sound, did it fall? Ah, memories! I still remember how my face burned. But dinner was fabulous afterwards! I remember that the shower I took afterwards was the best shower I’d ever had in my life!!! I don’t remember dinner. Where did we eat? You have very great friends! Thanks, Nini! Did you have any idea the house was this “challenging” when I first started working on in? In hindsight, I don’t think I did!